Welcome to Andover, Ma! 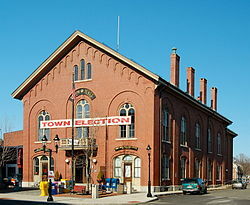 Andover is a true blend of the past and present, where deep historical roots (Andover Historical Society) and recent growth due to the influx of new families and people from all over the United States has brought new attitudes and has given the town a more cosmopolitan outlook. This prestigious town is known for its vibrant downtown with many quaint shops and trendy restaurants and is known the world over for being the home of one of the oldest and most prestigious independent secondary "prep" schools in the U.S. - Phillips Academy. Check out some of the best stores Andover has to offer -Izzy’s Emporium, Savoir Faire Home, and, The Andover Bookstore, one of the oldest bookstore in the United States. Restaurants to definitely try include Palmer’s Restaurant and Tavern, Yella, LaRosa’s, and Sweet Basil. Also, Live, Work, Shop and Play is the motto of Andover Village Square in the heart of downtown Andover-check it out! The town offers a myriad of opportunities to explore and enjoy the great outdoors. Whether it's hitting the links at one of the world class golf courses, hiking or cross country skiing along the many trails running through conservation lands, or canoeing along the pristine Shawsheen River, there's something for everyone. Widely regarded for its high quality public schools and community spirit, Andover has evolved into a highly desirable community. In addition to offering a full range of housing options, from high-end single family homes, to low to moderate income rental and ownership opportunities, Andover’s real estate market has been historically strong and resistant to economic downturns. Andover is just a short 30 min train ride to Boston on the Haverhill Commuter Rail Line and has two train stations to offer commuter, one in the heart of Andover center and one in the Ballardvale section of town. Call us to give you a personal tour of Andover. Listed by Peter Hill of Benoit Mizner Simon & Co. - Weston - Boston Post Rd. Welcome to the most unique home setting in Andover! There's no other property in town that is surrounded by Phillips Academy, the oldest secondary school in the country. The backyard abuts its athletic playing fields.This home has been owned by two generations of the same family and unavailable to the open market for over 50 years. A 2-minute walk to the brand new Bancroft Elementary School. This classic, stately home was designed by renowned architect Guy Lowell. Exquisite details include; arched foyer w/gracious fireplace formal living and dining rooms. Other elegant rooms include richly paneled library and exquisite butler's pantry. Kitchen is surrounded by family room w/fireplace, breakfast room, mud room and sitting room w/gas fireplace. Smart home technology. Spacious master suite has radiant heat, hardwood floors and spa-like marble bath w/steam unit. A truly magical place to grow a family and entertain with comfort and privacy. Incredibly unique location and truly special home! THIS AREA WAS NOT AFFECTED BY THE GAS CRISIS & THIS HOME IS HEATED BY PROPANE! Stunning 5 BR, Custom Built English Manor on a meticulously landscaped 3.6 Acre Private Lot. This incredible home features an open flr plan on the 1st flr incorporating the family room, kitchen, & butlers pantry w/ wetbar, as well as the dining room w/ a double-sided fireplace opening to the sun room to enhance the warmth. Additionally, enjoy your luxurious 1st Flr Master Suite featuring a fireplace, designer walk in closet, 1 of 2 laundry rooms, & an amazing master bath appointed w/ marble, double vanity, jetted soaking tub & walk-in shower. The work out room & 2 story cherry paneled study with coffered ceiling complete the 1st flr. 4 additional en-suite bedrooms, laundry room & media room complete the 2nd flr. The outdoor space is enhanced w/ numerous porches, decks, patios, & a fabulous heated saltwater pool, cabana w/ wet bar, changing room, 1/2bath & outdoor shower. Don't miss this Jewel!